No Solah Sringar for a woman can be complete without the kamarband. Colloquially called the challa or the patka, the waistbelt is an ornate strip of jewellery that graces the waistline of an Indian woman. It is a beautiful and unique element of sensuality that sits pretty on the waist of a bride too accentuating her waist in gold, kundan, pearls, stones, chains, Swarovski and precious gems. Yes it does contribute majorly to holding the sari in place but the workmanship of the kamarband worn on a saree, half saree or a lehnga has its own charm. The patka goes back to the Mughal era when it was considered as a fine piece of embellishment for the Maharanis. 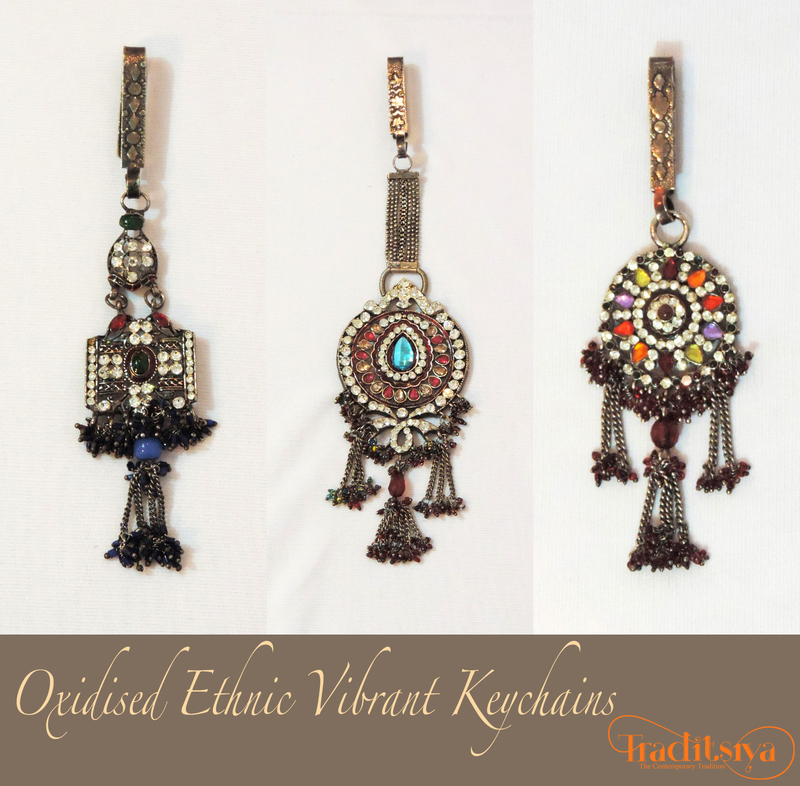 Over a passage of time, it began to be worn by the classical dancers of Kathak, Bharatnatyam and Odishi genre. The waistband further on became a hottie for leading Bollywood celebrities such as Shilpa Shetty, Deepika Padukone, Kareena Kapoor Khan and Jacqueline Fernandes in fashion shows and ramp walks. No wonder why this ‘jewellery of the waist’ has amazed the viewers from the regal past to the contemporary present. Undoubtedly, the waistbelt looks fabulous when worn over low waist sarees in ceremonial occasions such as sangeet, reception, wedding day and the festival of Navratri. 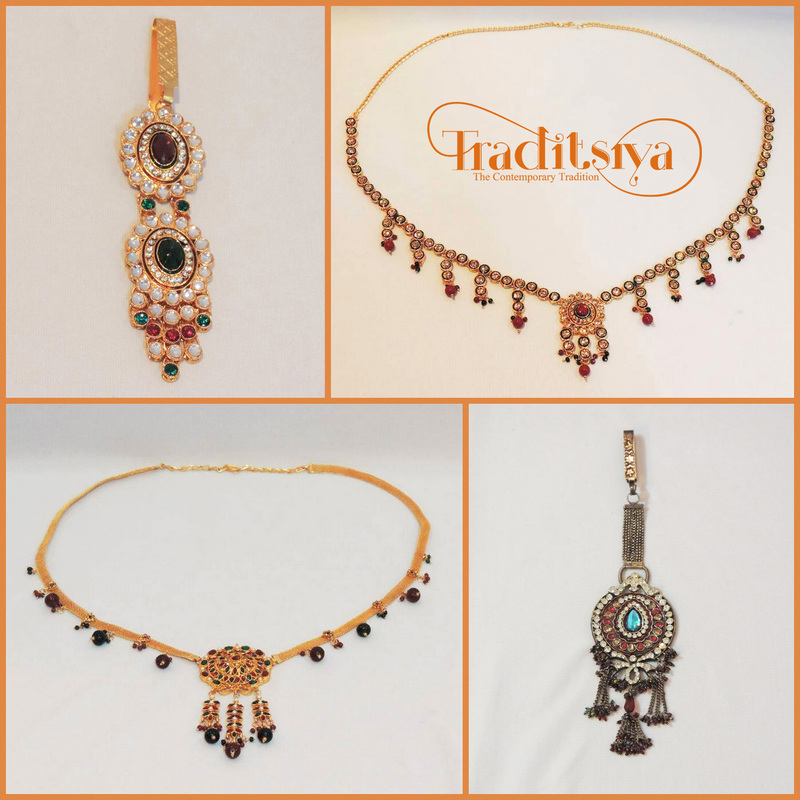 Traditsiya brings you an ornate collection of saree waistbelts, saree challas and hip chains redefining the picture perfect waistlines of femme fatales. Silver oxidised multicoloured challa that has a green stone embedded in the centre surrounded by oval series of red stones for the waist glamour. Antique and contemporary, this square shaped challa would go well with women draped in georgette and crepe sarees. Meet the colourful union of lilac, orange, rust, maroon, ivory yellow in a mesmerising oxidised waistbelt that brings a touch of tradition and modernity. 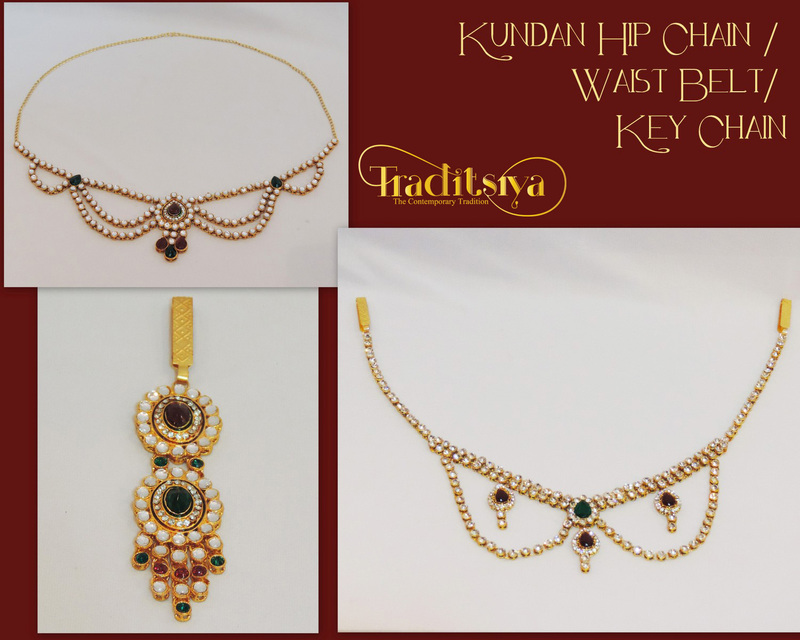 Let your curvaceous waist speak a delightful tale of glamour through this kundan challa bedecked with maroon and green stones. Two-looped kamarpatta bedecked with green and maroon stones that adds lovely grace to your waist in full measure. Watch the beauty of red stone sandwiched between the loops in this jhaalar bring designer quotient to your lehnga. Regale with joy in this pretty hip chain waistbelt that is studded with traditional pearls and diamante stones. Check out the polki and pearl beads fall dramatically over your waistline as you get dressed in a rich kanjeevaram for ceremonial occasions.